receive a warm welcome at Sunbeam Hotel Pattaya, located between Beach Road and Pattaya 2nd Road, Beautifully decorated with a fresh oceanic atmosphere, in addition. Conveniently sited close to a great number of Pattaya shopping centers and tremendous nightlife entertainment complex. 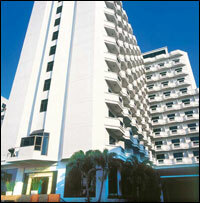 - Sunbeam Hotel Pattaya does have extra rollaway beds and request is subject to availability and prior notice. - Children below 12 years of age, accompanied by their parents, enjoy complimentary stay (no extra bed) in the room, with a maximum of 2 children per room or 2 adults and 2 children, a total of 4 persons. Breakfast for children below 12 years is chargeable at 50% of the adult price. - Written cancellation by email or fax is required to E-Biz Travel at least 14 working days (Not including Sat, Sun & Public Holidays) prior to arrival during High season (1 Nov-20 Dec & 16 Jan-13 Feb & 23 Feb-30 Apr) and 7 working days (Not including Sat, Sun & Public Holidays) prior to arrival during Low season (1 May-31 Oct); Otherwise, a minimum of one night room rate (per each room reserved) will be charged. - Written cancellation by email or fax is required to E-Biz Travel at least 30 working days (Not including Sat, Sun & Public Holidays) prior to arrival during Peak season (21 Dec-15 Jan & 14-22 Feb); Otherwise, a penalty 50% of total amount will be charged. - No Show : One night charge (per each room reserved) will be levied. Where bliss begins the moment you walk in ... Comfort, privacy and countless entertainment possibilities await in a cool, calm environment where modern facilities blend with the authentic taste of Thailand.This 12-storey hotel includes a delightful lobby and comprises 256 beautifully decorated Superior and Deluxe rooms and Suites in singles, doubles and family rooms. Every room features comprehensive facilities for your comfort and pleasure, including both hot tub and shower, mini bar, international and local TV. program and 24 hour room service. And each with its own balcony to catch a refreshing sea breeze and admire the charms of Pattaya. Open Daily from 06:00 a.m. - 02:00 a.m. Enjoy the music as you indulge in a cocktail, whisky or glass of wine, then why not dance till midnight? Open Daily from 02:30 p.m. - 12:00 a.m.
Open Daily from 09:00 a.m. - 07:00 p.m. Convenient, relaxed and clean. Release tension and improve your health …Very popular with all visitors and guests at the hotel. Open Daily from 11:00 a.m. - 01:00 a.m.
And for busy businessmen, Somprasong meeting room 1 and 2 on the top floor panoramic views of Pattaya and full support for seminars and conferences for 25-300 persons. Or for private meetings of 10-40, the Crystal Room is just right. Naturally, all are fitted with complete seminar and 24 hours on-line communications equipment.